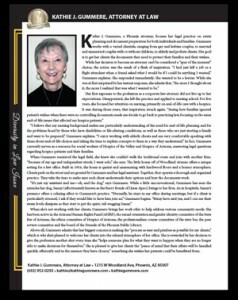 Kathie J. Gummere is an Arizona attorney in private practice focusing on estate planning, particularly for gays and lesbians and unmarried couples. She is a past political consultant and lobbyist for the Arizona Human Rights Fund, (AHRF). Kathie was instrumental in establishing and is a past Chair of the Sexual Orientation and Gender Identity Committee of the State Bar of Arizona, the first state bar in the nation to establish such a standing committee. And, she is a frequent speaker on gay and lesbian legal and political issues for such varied forums as colleges, municipalities, corporations, religious organizations, and legal continuing education programs. Kathie took a break from law and got a BSN in nursing from ASU. After which, she practiced nursing for about 5 years, focusing on terminal care. She now serves as a resource for social workers of Hospice of the Valley and Hospice of Arizona, answering legal questions regarding hospice patients and their families. Plus, she currently serves as a member of the Ethics Committee of Hospice of Arizona. She also served on the Professionalism Course Committee of the State Bar, and currently sits on the Peer Review Committee. In addition, Kathie sits on the Board of the Friends of the Phoenix Public Library.